Packed with expert tips on how to bluff successfully Rake in the chips with this savvy guide to poker basics and beyond Whether you're looking for an edge in a friendly weekly game or aiming for the championship in a local poker tournament, this friendly guide shows you step-by-step how to bet, bluff, and play your way to the top, from seven-card stud and high-low splits to Omaha and Texas Hold 'em. 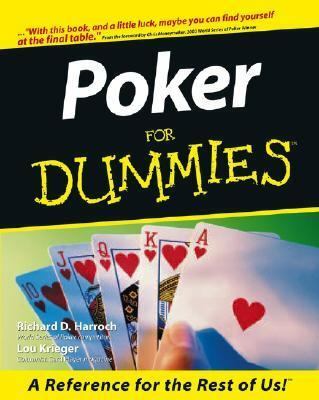 Discover how to: Understand poker rules Play popular poker games Keep a "poker face" Read your opponents Participate in poker tournaments Make the most of video and Internet poker The Dummies Way Explanations in plain English "Get in, get out" information Icons and other navigational aids Tear-out cheat sheet Top ten lists A dash of humor and fun Get smart! www.dummies.com Register to win cool prizes Browse exclusive articles and excerpts Get a free Dummies Daily e-mail newsletter Chat with authors and preview other books Talk to us, ask questions, get answersHarroch, Richard D. is the author of 'Poker for Dummies' with ISBN 9780764552328 and ISBN 0764552325.